A few weeks ago, my wife and I had the opportunity to visit Southern California for the first time. I know, I know. It’s hard to believe that we’d never been there before, but it is true. Frankly, it is a long way from our home base in Indiana, and we’ve never really had any reason to go to California. So, we decided to tack some extra time onto the end of our trip to Las Vegas and head to sunny Laguna Beach for a few days. To be honest, I wasn’t sure I was going to like SoCal. Personally, I could never figure out what all the hype was about. I’ve been a lot of beautiful places in my life, and Southern California just didn’t seem to be burning a hole in my pocket. After landing in L.A. and spending the afternoon there, I was really starting to wonder what the big deal was. We spent some time meandering through Hollywood and Beverly Hills, but the neighborhoods and houses weren’t any nicer than a lot of the places near where we live. Then, there is the traffic. If there’s one thing (other than movies…and smog) that L.A. is famous for, it is this. Trying to get out of L.A. was pretty much a nightmare. Where we come from, driving 40 miles should take 40 minutes to an hour, tops. Our little trek to Laguna Beach took us about 2 hours. Oi! However, once we made it into Orange County, the traffic began to subside and the natural beauty of the area took our breath away. After exiting I-5 onto CA-133, we could barely contain our excitement. As we began our downward descent into Laguna Beach, we were blown away by the scenic hills and cliffs surrounding the town. Winding our way down to the beach, we immediately felt at home with Laguna’s artsy vibe. 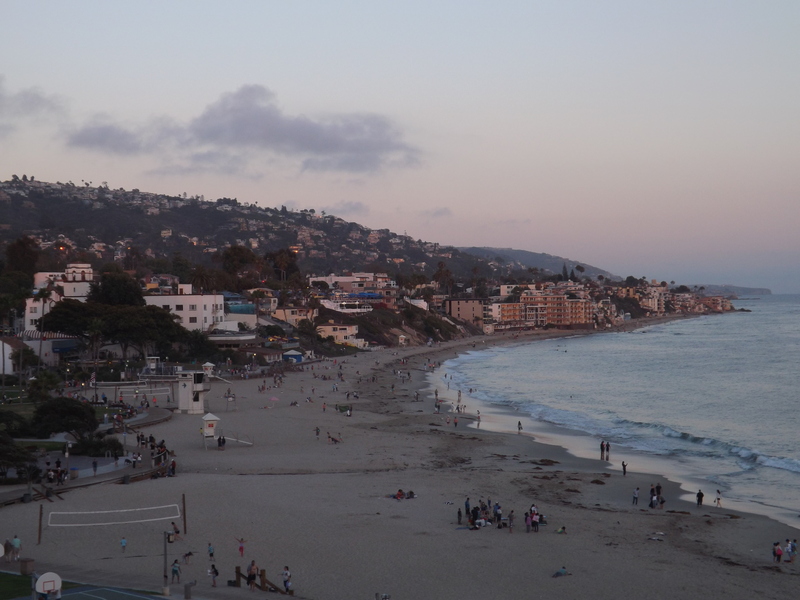 We hit the “T” at CA-1 and spotted our hotel, The Inn at Laguna Beach. Located right on the famous “Pacific Coast Highway,” The Inn at Laguna Beach is super easy to find – even if you’ve never been there before. Although we flew into L.A., you could just as easily fly into San Diego and rent a car there. The trip from the airport is a little bit further, but you’ll probably save yourself some traffic headaches. Either way, the quickest route to Laguna is heading down (or up) I-5 to CA-133. Take that toward the beach, hit the “T”/stoplight at the beach, and hang a right. You’ll find the Inn at Laguna Beach immediately on your left. If you’ve never been there before, pulling into The Inn is a little tricky. Driving up to the hotel, you’ll notice a small parking lot above ground and a small parking garage under the entrance. I missed the turn for the underground lot and had to turn around up top in order to go back down. The lot up top is almost always full, so save yourself the trouble and just park below ground right away. Walking into the hotel, we instantly relaxed due to the upscale beachy vibe of the place. The lobby area is small, but nice. At the reception desk, Michael was very helpful and quickly checked us in. 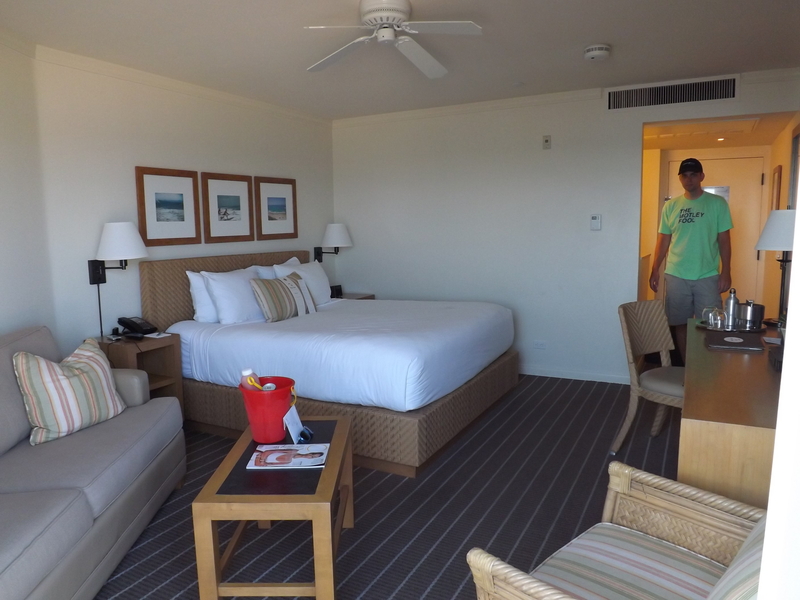 The Inn’s laid-back beach vibe continued as we entered our room. We booked a balcony room with an ocean view, and we loved it. The room itself was pretty much a classic California-style beach resort room that you’d see in the old beach movies. However, it was very clean and had plenty of modern amenities. Along with the comfortable king bed, the room featured a small seating area, double sinks, and a nice shower (although no bathtub). There was also a nice-sized flat-screen TV and a complimentary wireless internet connection, which worked very well. The Inn even thought to put a pair of binoculars in the room, which was a nice touch for those who enjoy watching marine life. While all of this was great, the best part about the room was the gorgeous view! Our room featured a balcony situated directly above the beach, complete with a splendid view of both the town and the ocean. The balcony had a seating area that was big enough for two people, which we enjoyed each evening while beachgoers strolled by on their way to dinner using the walking path below. Because of the way the beach faces, the time of year we visited, and the location of our particular room, we were not able to see the sun set completely over the horizon from our balcony. My guess is that you can see it set in the Spring or Fall. However, the sunset was easily visible by walking down the stairs to the beach or up the hill about 100 yards off the property. 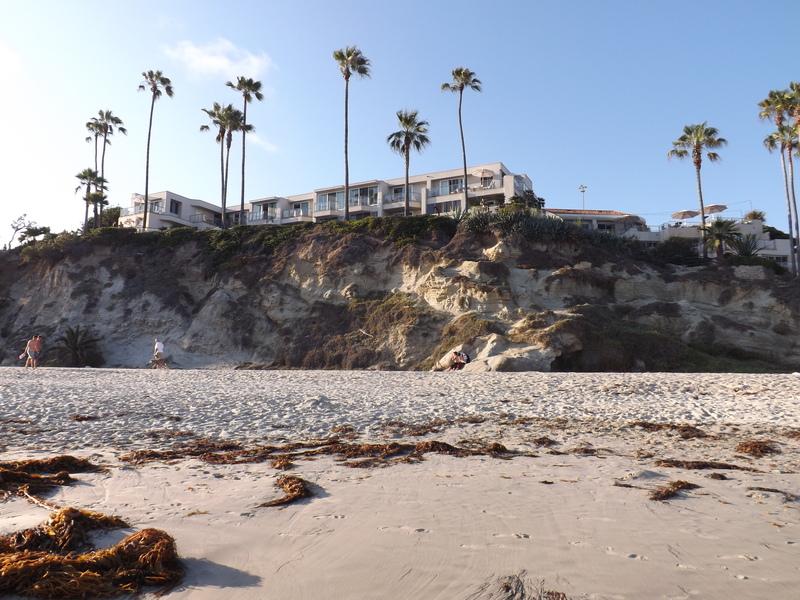 The Inn at Laguna Beach sits directly beside the main public beach in Laguna, although it is my understanding that all the beaches here are available to the public. Directly to the property’s south, you’ll find a beautiful boardwalk, several beach volleyball courts, and plenty of places to sit and take in the view. 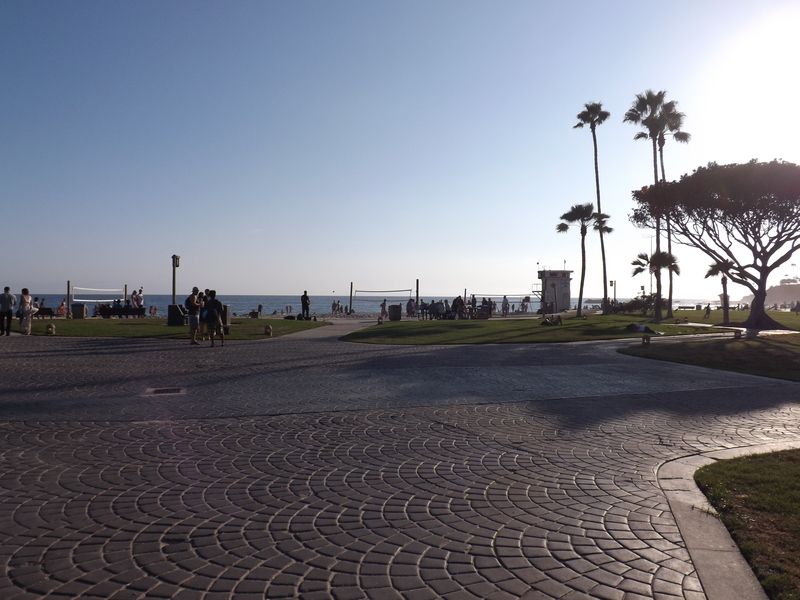 If you keep walking, you’ll run directly into part of Laguna’s business district, filled with artsy beachside boutiques, beautiful galleries, and lovely restaurants. From The Inn, you’re literally only a 5-minute walk down the beach (or boardwalk) from here. When it comes to beaches, I tend to be a little bit of a sand snob. If I get to choose, I prefer the sugary white sand of Alabama and Florida’s northern Gulf Coast. With that being said, the sand here is very nice. It is soft and powdery like the Gulf Coast, but just a little darker. The beach is well-groomed, but you will find piles of seaweed along the water. If that bothers you, maybe you should try going to a pool instead. 🙂 Even a sand snob like me can’t complain about this beautiful beach! The Inn from the beach below. If you are used to the warm waters of the Caribbean, you’re in for a surprise. Due to the cold currents that run along California’s coast, the water is much cooler than what you’d experience in places like St. Maarten. That didn’t stop us from getting in, however. In fact, jumping in the water for a few minutes is a great way to cool off from the 80 degree heat – which is pretty much the temperature every day in Laguna. Need a beach chair? No problem. Forgot your towel? They’ve got it covered. Simply take the steps from The Inn directly to the beach and speak with one of their helpful beach attendants. Enjoy your day on the beach and return the items when you’re done! Easy peesy! Each day between 5-6 P.M., The Inn at Laguna Beach invites guests to a complimentary wine reception at their Rooftop Bar. The aura is laid-back and enjoyable. Plus, how can you say “no” to free wine?!? The view from the Rooftop Bar is spectacular! 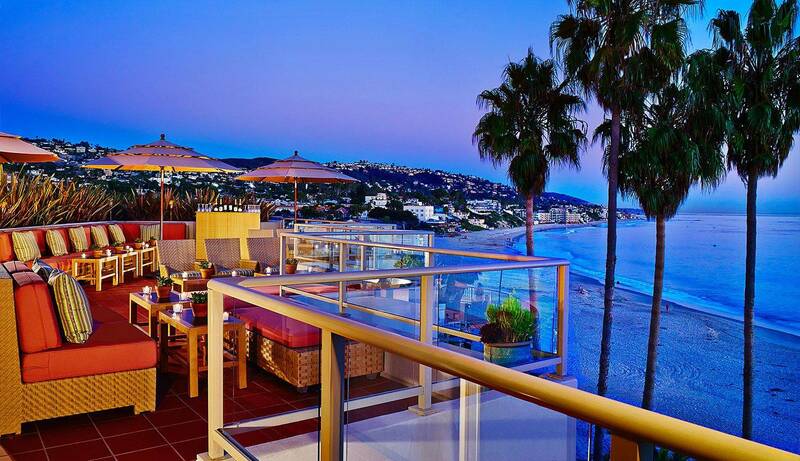 It has to be one of the best views in all of Laguna Beach. You can soak up a wonderful view of the water, beach, and the town all at once. The coastline’s rocky exterior and the dwellings on the surrounding cliffs reminded me slightly of the Amalfi Coast. It is super cool, and I can’t wait to go back. We spent a little time on the Rooftop Bar and enjoyed the company of our bartender Tiffeny. A Midwesterner turned surfer girl, Tiffeny was happy to chat with us and swap travel stories of her own. If you get a chance, make sure to stop up and say hello to her! The Inn at Laguna Beach partners with Las Brisas Restaurant to deliver specialized breakfast, lunch, or dinner options directly to your room. If you’d like to eat out, the restaurant is practically attached to the inn, so you can walk from your room to your table in about 2 minutes. Menu options include Snapper Veracruzano, Chile Rubbed Ahi Tuna Charro, and – of course – Filet Mignon. Main dinner entrees generally run between $25-50, so it is perfect for a romantic night on the town. As I mentioned earlier, you can easily take the boardwalk from The Inn to several beachside restaurants in town. The very first restaurant you’ll reach on the beach-side of the street is called Greeter’s Corner. They have a delicious Mahi Burger topped with jalapenos and served with a healthy side of cole slaw for about $15. Down the road a few blocks further is C’est la Vie Restaurant, an authentically little French place in the heart of Southern California. The outdoor patio seating has beautiful views of the beach, and the Sea Bass is fantastic. Not in the mood for fish? Try the Quiche Florentine – yummy! 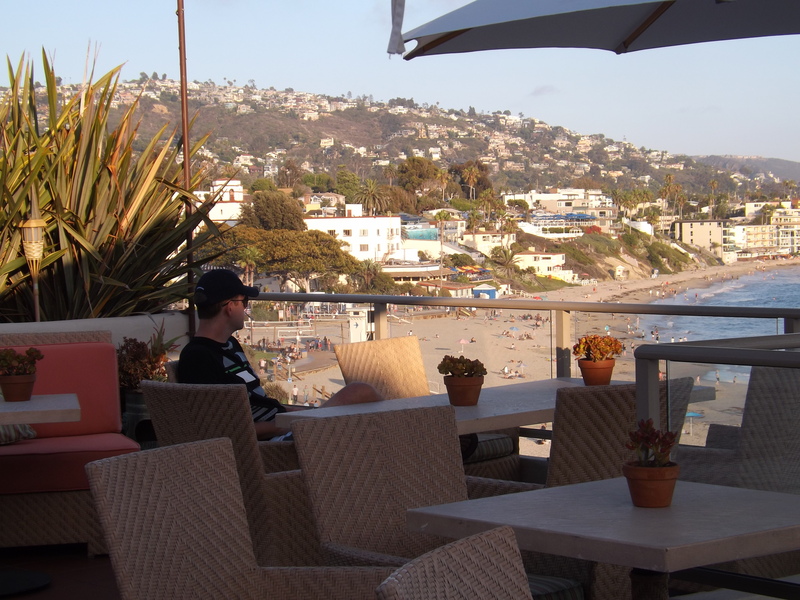 Where is The Inn at Laguna Beach located? The Inn at Laguna Beach is located at 211 N. Pacific Coast Highway in Laguna Beach California. It is about 1 block north of the stoplight at the intersection of CA-1 and CA-133. We flew into Los Angeles International (LAX) and flew out of San Diego International (SAN). The drive from LAX is approximately 1 hour (depending on traffic) while the drive to San Diego International is about 90 minutes…with less traffic. Either option is good. Depending on which accommodations you select, most rooms generally start at about $400/night and run up to around $800/night. Between October and April, rooms are slightly cheaper, starting at around $300/night. Several different activities and romantic packages are also available. Some dates require a minimum night’s stay, so you’ll want to check on that before you book. The Inn only has 70 rooms, so it tends to book up during peak seasons. If no room is available, they own a second property located in town called The Laguna Beach House. Book ahead for more availability options and to take advantage of the best room rates. The hotel itself does not have a restaurant, although you may order from a limited menu at The Rooftop Bar. However, the well-known Las Brisas Restaurant is practically attached to the hotel and is within a 2 minute walk. Furthermore, The Inn at Laguna Beach and Las Brisas have teamed up to offer guests a special breakfast, lunch, and dinner menu that may be delivered directly to your room. Additionally, there is a plethora of dining, shopping, and entertainment options just a few blocks away. The Inn at Laguna Beach provides parking for guests. There is a parking fee of about $30. What other amenities does The Inn at Laguna Beach offer? Beach umbrellas, chairs, and towels are available for all guests of The Inn. Direct access to the main beach is available via a small set of stairs. An outdoor pool is also available for guest use. The rooms feature flat screen TVs, HBO, an in-room safe, and a complimentary high-speed wireless internet connection. Additionally, guests are invited to a complimentary social hour and wine tasting event held between 5-6 P.M. each evening at The Rooftop Bar. No, however you may need to pay for parking. What is there to do in Laguna Beach? Laguna Beach is home to numerous shops, restaurants, and art galleries. Each evening during the summer, Laguna Beach is home to the “Pageant of the Masters” in which real people pose in live recreations of famous paintings, truly bringing art to life. There are numerous outdoor activities available – including hiking, snorkeling, paddle boarding, kyaking, and surfing. Then, of course, there is the beach! Where can I book a room? 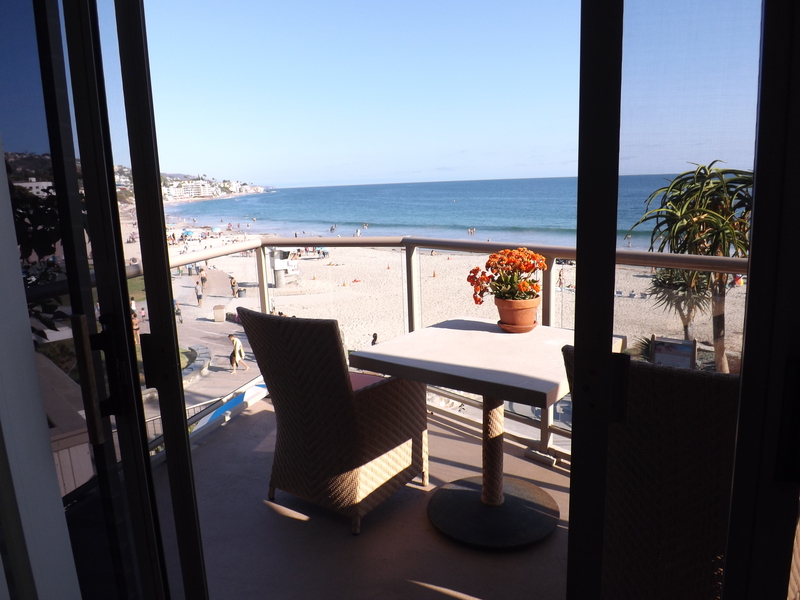 To make reservations with The Inn at Laguna Beach, you may call (800)544-4479 or book online here. 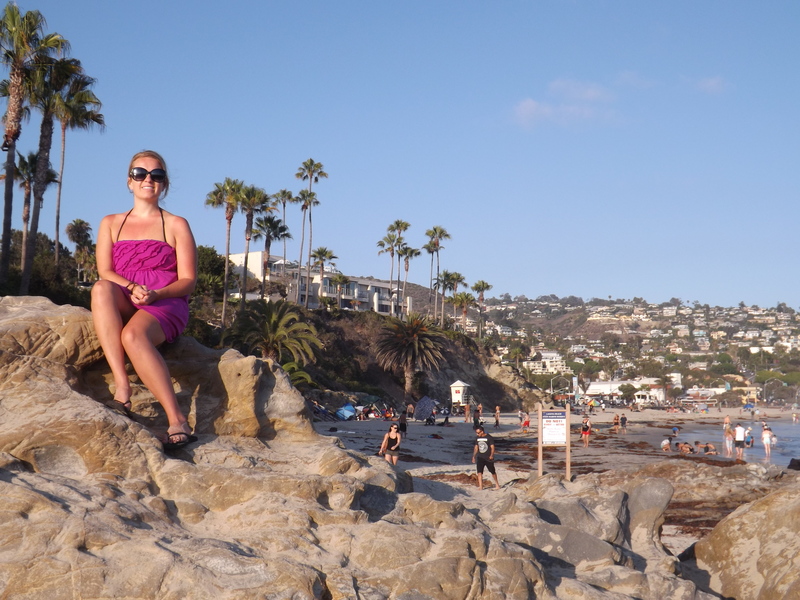 To my surprise, we unexpectedly fell in love with Laguna Beach. It has become one of my favorite beach towns anywhere in the world! I wish we would have been able to spend more time there, but we’ll definitely be bringing the kids back for a fun family vacation in the near future. 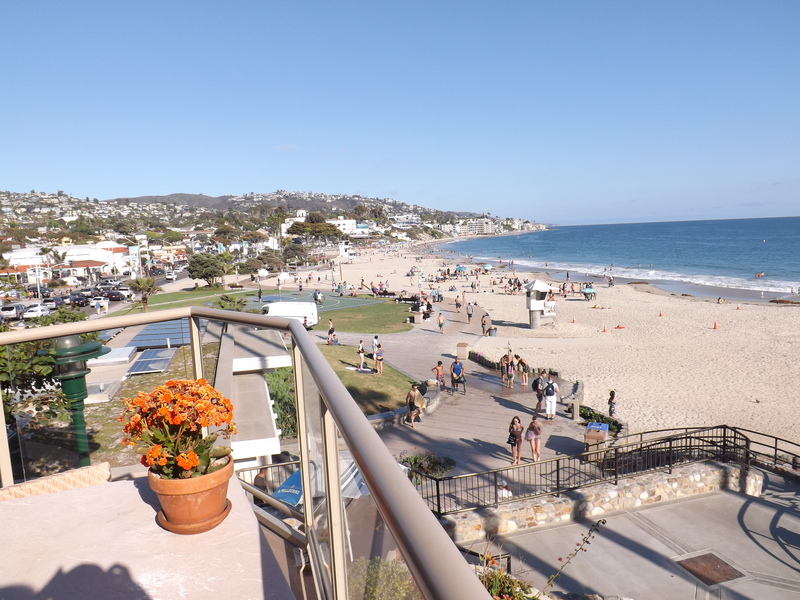 If you’re looking for lodging in Laguna, The Inn at Laguna Beach can’t be beaten. The rooms are nice, the views are beautiful, and the staff is extremely kind, knowledgeable, and helpful. 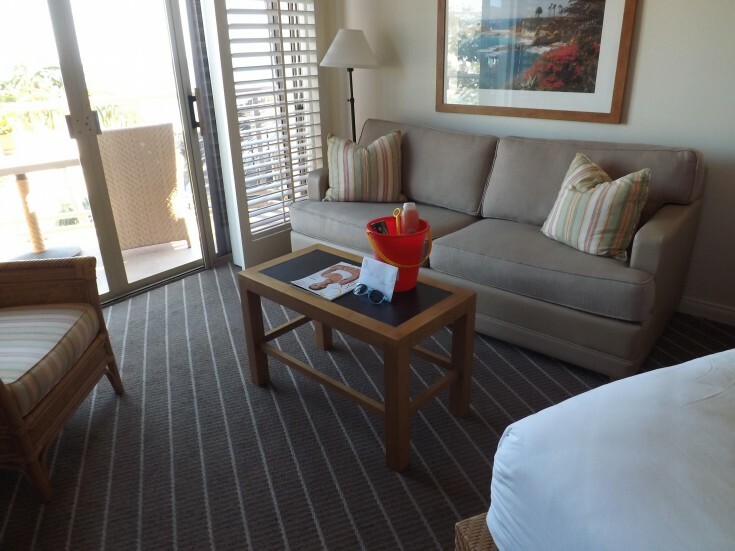 Whether you’re looking for romance or family fun, The Inn at Laguna Beach has you covered!